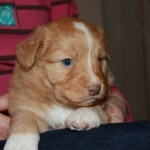 Nova Scotia Duck Tolling Retriever Puppies available. We have a fantastic litter of Nova Scotia Duck Tolling Retriever puppies available, these puppies are from health screened parents and are hereditary clear for prcd – PRA and CEA/CH. 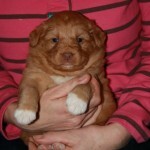 Nova Scotia Duck Tolling Retriever puppy.